Babe Ruth. Ballplayer. Brownie. Mom. 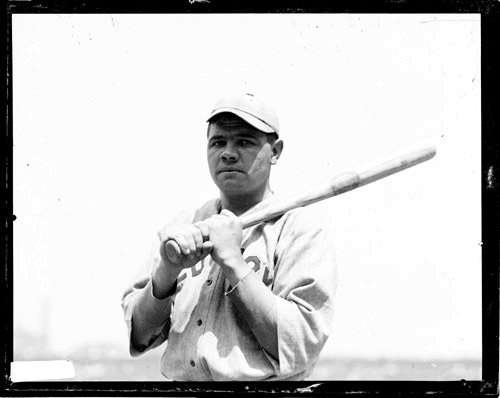 On July 11, 1914, George Herman Ruth played his first major league game. He had recently joined the Boston Red Sox and was already known as “Babe”. He pitched seven innings, gave up three runs (two earned), and got a no decision in a 4-3 win over the Cleveland Naps (later the Indians). He went 0-for-2 at the plate. His first major league at bat? A strike out. If you want the stats, you can find plenty online. But, how about some other Ruthian notes on this auspicious day? The Café? A polite way of saying saloon. 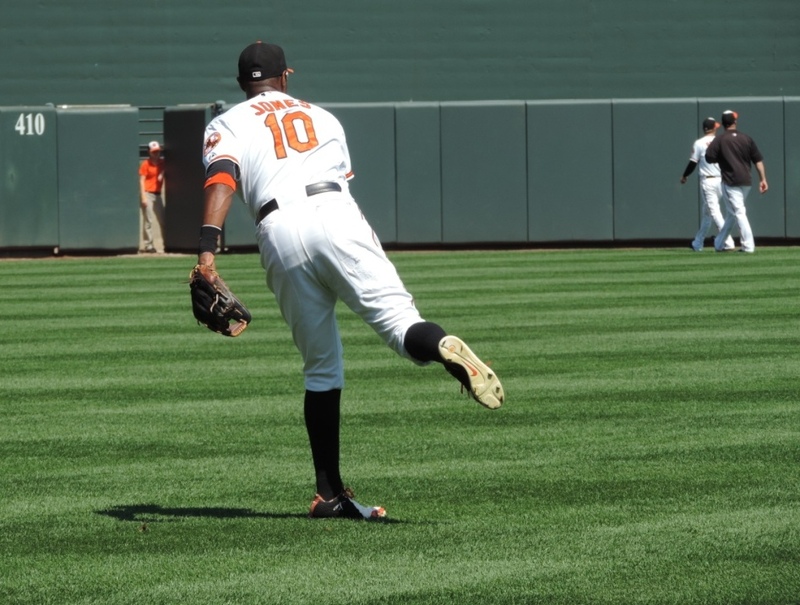 Adam Jones, Orioles Centerfielder. Camden Yards. 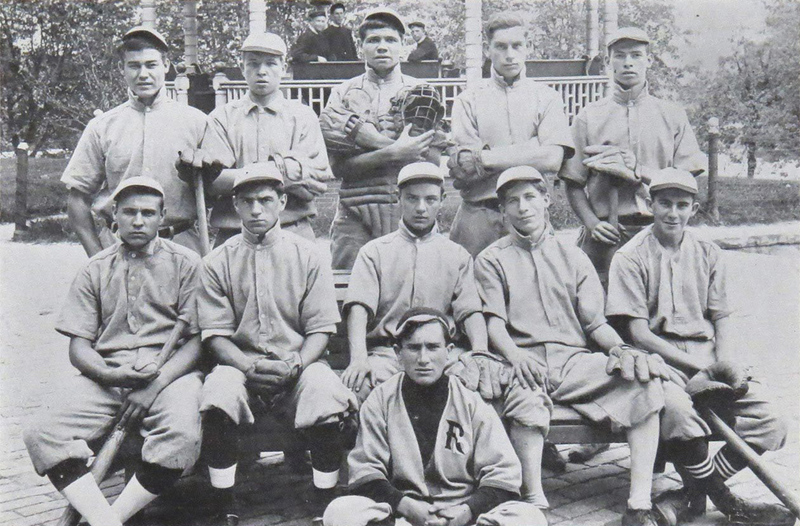 While at St. Mary’s – a reform school/orphanage for wayward boys where Ruth was sent by his family for being “incorrigible” – he began to play as part of a formal school baseball league. He was a star of the league and played catcher – a lefty catcher (a rarity then and now). Babe Ruth, Catcher. St. Mary’s. Back Row, Center. 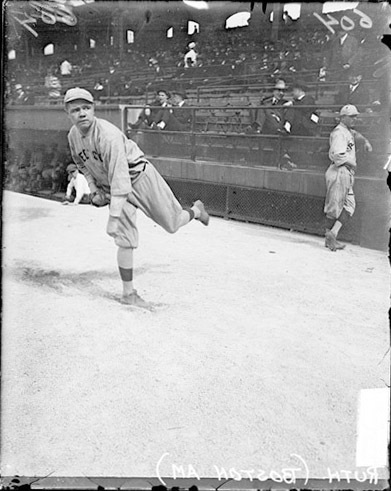 He later moved to pitcher and in 1913, his last year at St. Mary’s, according to historian Robert Creamer, he homered in nearly every game he played and was undefeated in every game he pitched. And, no, it wasn’t the current Baltimore Orioles. They have only been in Baltimore since 1954, and were previously the St. Louis Browns. The Baltimore Orioles that signed Ruth were a minor league team in the International League – a team that was originally based in Montreal. The Orioles weren’t even the most popular baseball team in Baltimore that year. They played a woeful second fiddle to the Baltimore Terrapins, a Federal League team. They couldn’t compete with the popular Terps and Ruth was quickly sold to the Boston Red Sox. The next season, those Orioles packed up and headed to Richmond, Virginia. Babe Ruth and two other Orioles were sold to the Red Sox in July 1914 for a reported $25,000. The Curtiss Candy Company always claimed they named the Baby Ruth bar for Ruth Cleveland, President Grover Cleveland’s daughter who died at age 12 in 1904, which was nearly 20 years before the candy bar even appeared. More likely is that the Curtiss Candy Company jumped on the Babe Ruth bandwagon, but Ruth Cleveland was a convenient back story that would allow them to avoid paying Babe for his image, likeness, name, and endorsement. Should you wish to argue that Babe Ruth and Baby Ruth are two completely different names: Reporters of the day would, on occasion, refer to the Babe as “Baby Ruth” and here’s some proof of that. In the 1990s, Nestlé, which now owns the brand, contracted with the Ruth family to use the Babe’s image in their marketing. But, if you dig around, you can uncover this Gooey Baby Ruth Brownie recipe! A candy bar melted into a brownie? With cream cheese? The Babe would definitely put his name on that! In 1922, Ruth lost a fly ball in the sun while playing left field at New York’s Polo Grounds. At the Polo Grounds and in Yankee Stadium, for instance, he would always be in right field. At Boston’s Fenway Park, however, he would forever after play in left. I wonder where he would have played at the Trop? He didn’t literally build it. He did, however, have basic tailoring skills and while at St. Mary’s briefly worked at a shirt factory. His job was to attach collars and he was paid six cents a collar. Seriously. But, not Babe Ruth. My mom was named Julie at birth, but everyone in the family and most everyone in town knew her as Babe. Her high school yearbook lists her as Babe, too. She was called Babe, she said, because she was the youngest in her family and the youngest in her class. Sadly, her daughter’s witty jokes about her being named for Babe Ruth or Babe the Blue Ox were wholly unappreciated. In the 1930s, Babe Ruth discovered that he was a year older than he had been told he was, when he had to produce a certified birth certificate in order to get his passport. In the 1990s, Babe, my mom, discovered that she was a year older than she had been told she was, when she had to produce a certified birth certificate in order to get Social Security. This entry was posted in Baltimore Orioles, Baseball, Baseball History, Mom & Dad and tagged Babe Ruth, Boston Red Sox by Jackie, The Baseball Bloggess. Bookmark the permalink. YOU CAN JOIN MY RESEARCH TEAM ANY DAY; what a fun group of things related to the Babe to post! I love the fact he was born in the O’s centerfield (today). A worthy anniversary to commemorate. Thanks! Thanks, Lynne! I love tracking all the different versions of the Orioles … they wander their way through baseball every which way … It’s even more interesting when Babe Ruth is involved! I would have loved to see the Babe stand in against Bob Gibson, especially if he pointed to center field to call his shot. I’ve never cared for any of the movies made about Babe, too often depicted as a heavy drinker and smoker. Joe Don Baker’s “Whammer” in “The Natural” (Yes, I know that didn’t follow the book) was apropos. Baby Ruth brownies are just Snicker brownies with cream cheese; either way, I don’t eat them, much less bake them, anymore. I wonder what Babe’s stats were with Gehrig hitting in front or behind him. I love Jean Shepard’s account of how his father felt about the Iron Horse, and the results thereafter. Babe was baseball’s first and greatest draw, but I don’t want to hear anymore about the Curse of the Bambino. Snickers Bars — named after someone’s family horse. One hundred years ago today, wow. I’m feeling my age a bit as I remember the delight of taking my nickel clutched in a tight fist to the shop on Cicero Avenue in Chicago to purchase a great big Baby Ruth that would be savored in my mind until I got back home to sit down and devour it. That was in the early 1940’s when a candy bar was sizable enough to almost make a meal. Thanks for the memories of Babe and Baby Ruth. Thanks Gloria … In honor of the Babe, I’m making those Baby Ruth brownies this weekend … I’ll let you know how they turn out! This was a fun read :) Thanks for digging all this up and sharing with us all! The Babe’s “fun facts” seem to go on endlessly, don’t they? Thanks so much for stopping by!